The Mini Vinnies, an innovative programme from the St Vincent de Paul Society, has hit the 600 member mark in Shrewsbury, bringing it to an all time high. The initiative is aimed at children between the ages of seven and 11 who, with the permission of their parents and the support of their schools or parishes, are encouraged to embark on their first steps as “Vincentians for Life”. Since introducing the Mini Vinnies into the Shrewsbury Diocese in 2010, children in almost 40 schools have joined the Vincentian family. 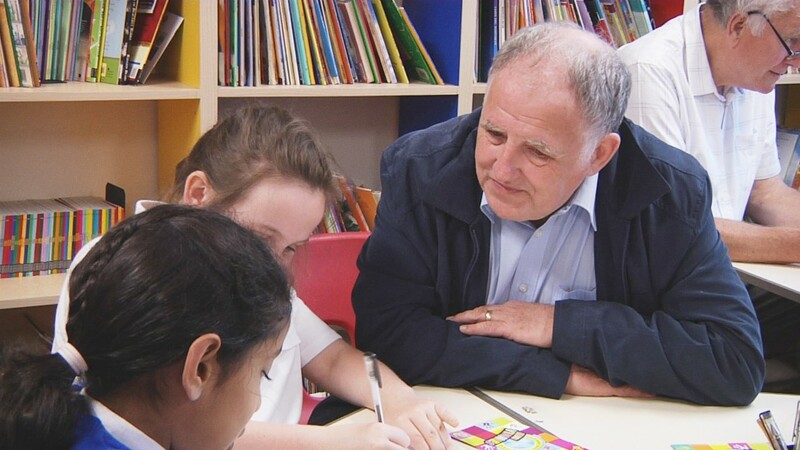 SVP National President Adrian Abel met with Mini Vinnies at St Aidan’s Catholic Primary School in Wythenshawe and at St Christopher’s Catholic Primary School in Stockport. “They knew all about the SVP and its works and showed a great of interest in the Society,” said Mr Abel. Mrs Margaret McGee, headteacher of St Aidan’s, Wythenshawe, was delighted to emphasise the success of the Mini Vinnies programme. The SVP photograph shows Mr Abel with Mini Vinnies during his visit.